Your inventory distribution is one of the most important aspects of your online inventory marketing success. It’s imperative the right vehicles are being sent to the right online classified sites and marketplaces at the right price. Our distribution library includes over 400 online marketplaces and classified sites…if a website can accept our feed of your inventory, we will send it. Rest assured our system will seamlessly manage your online classified listings without you needing to lift a finger. Getting your cars and trucks online should be a completely automated process, regardless how many different sites your dealership displays your inventory on. With Auction123’s automated data distribution, you can have peace of mind that your inventory is being advertised correctly on each classified site, online auction, or marketplace you choose. Advertise your inventory on the top online classifieds and marketplaces like AutoTrader.com, Cars.com, and OVE.com where millions of shoppers are looking for their next vehicle. Your data will be fed daily (sometimes multiple times per day) to an unlimited number of sites keeping your inventory up–to-date with pricing, mileage, descriptions, and sold vehicles. If you don’t see an online classified site in our distribution library of over 400 supported feeds, let us know and we’ll set it up. In addition to marketplaces requiring a paid subscription membership, Auction123 will automatically publish your inventory to the free listing sites that generate the most traffic. LemonFree.com, AOL Autos, Vast.com, and Oodle.com are just a few of the sites your inventory will be posted to help generate more leads for your vehicles. You may have accounts with other service providers your dealership or group works with who need an updated feed of your inventory. With Auction123, we can take care of your inventory distribution to any service provider necessary. Your feeds to OEM website providers like Dealer.com, Cobalt, DealerDirect will be delivered seamlessly from your Auction123 dashboard. 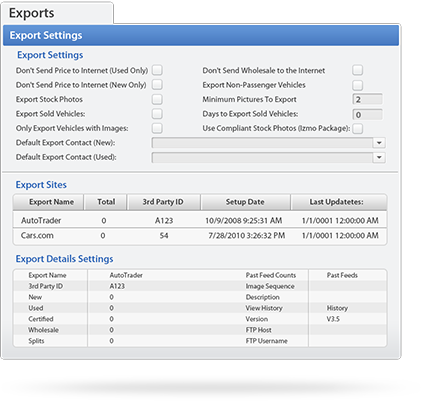 Your Auction123 dashboard will offer complete transparency to all your inventory exports by detailing each website, the number of vehicles fed, and the last export time for all of your selected marketplaces. 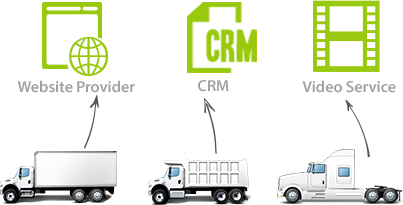 Additionally, we can filter your inventory by nearly any possible parameter to ensure only the vehicles you want to be exported are delivered to the exact sites they are intended for. Multi-rooftop groups: let us combine your locations in one feed to any shared online classified account. RV and Camper dealers don’t need to worry about manually keeping inventory up-to-date online. The Aucton123 system will save time and boost efficiency by automatically distributing your RVs to any online classified site or marketplace you have an account with. Changes made to your inventory from within the Auction123 system will be fed daily to each site you advertise your inventory on automatically. Advertise your inventory on the top online classifieds and marketplaces like RVTrader.com, RVT.com, and OVE.com where millions of shoppers are looking to find their next RV or camper. Your data will be fed daily (sometimes multiple times per day) to an unlimited number of sites keeping your inventory up–to-date with pricing, mileage, descriptions, and sold vehicles. If you don’t see an online classified site in our distribution library of over 400 supported feeds, let us know and we’ll set it up. In addition to marketplaces requiring a paid subscription membership, Auction123 will automatically publish your inventory to the free listing sites that generate the most traffic, such as Oodle.com. The more shoppers who see your inventory, the more leads you are likely to generate. You may have accounts with other service providers your dealership or group works with who need an updated feed of your inventory. With Auction123, we can take care of your inventory distribution to any service provider necessary. Feeds to website providers like RVUSA.com, Interact RV, and MyRVAdvantage will be delivered seamlessly from your Auction123 dashboard. Your Auction123 dashboard will offer complete transparency to all your inventory exports by detailing each website, the number of RVs fed, and the last export time for all of your selected marketplaces. Additionally, we can filter your inventory by nearly any possible parameter to ensure only the RVs and Campers you want to be exported are delivered to the exact sites they are intended for. Multi-rooftop groups: let us combine your locations in one feed to any shared online classified account. Powersports and Motorcycle dealers need to know their inventory is advertised correctly and consistently across all marketing channels. With Auction123’s automated data distribution to online classified sites and marketplaces, dealers can spend more time selling units and less time manually updating inventory or checking the accuracy of their listings. Advertise your inventory on the top online classifieds and marketplaces like CycleTrader.com, ChopperExchange.com, and CarSoup.com where millions of shoppers are looking for their next vehicle motorcycle or ATV. Your data will be fed daily (sometimes multiple times per day) to an unlimited number of sites keeping your inventory up–to-date with pricing, mileage, descriptions, and sold untis. If you don’t see an online classified site in our distribution library of over 400 supported feeds, let us know and we’ll set it up. You may have accounts with other service providers your dealership or group works with who need an updated feed of your inventory. With Auction123, we can take care of your inventory distribution to any service provider necessary. 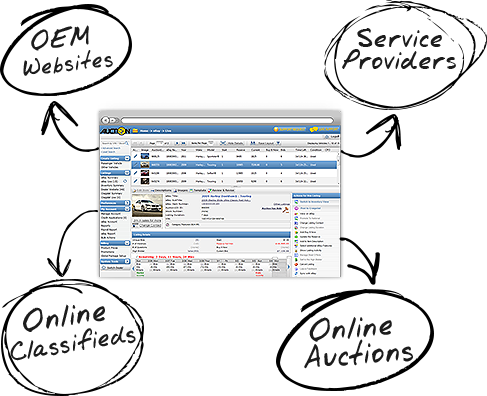 Feeds to service providers like DealerSpike and CarsForSale.com will be delivered seamlessly from your Auction123 dashboard. Your Auction123 dashboard will offer complete transparency to all your inventory exports by detailing each website, the number of units fed, and the last export time for all of your selected marketplaces. 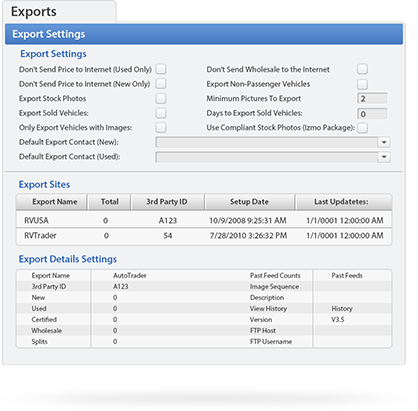 Additionally, we can filter your inventory by nearly any possible parameter to ensure only the vehicles you want to be exported are delivered to the exact sites they are intended for. Multi-rooftop groups: let us combine your locations in one feed to any shared online classified account. With Auction123’s automated data distribution for marine inventory dealers, your inventory can be pushed to many online marketplaces or classified sites without the need to manually manage any of your accounts. Changes to your boat inventory made from within your Auction123 account will automatically be published to all your marketplaces with the next feed. Advertise your boats on the top online classifieds and marketplaces like BoatTrader.com, BoatLine.com, and BoatingLife360.com where millions of shoppers are looking for their next boat. Your data will be fed daily (sometimes multiple times per day) to an unlimited number of sites keeping your inventory up–to-date with pricing, descriptions, new units, and sold vessels. If you don’t see an online classified site in our distribution library of over 400 supported feeds, let us know and we’ll set it up. You may have accounts with other service providers your dealership or group works with who need an updated feed of your inventory. With Auction123, we will take care of all your inventory distribution to any service provider necessary. Your feeds to website providers or CRM solutions will be delivered seamlessly from your Auction123 dashboard. 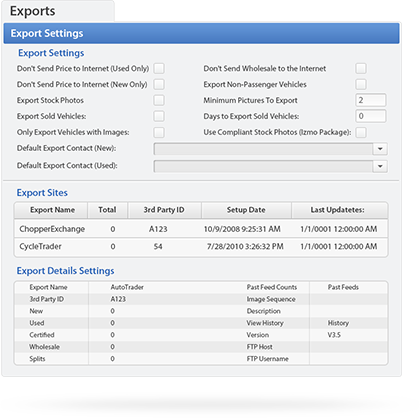 Your Auction123 dashboard will offer complete transparency to all your inventory exports by detailing each website, the number of boats fed, and the last export time for all of your selected marketplaces. Additionally, we can filter your inventory by nearly any possible parameter to ensure only the boats you want to be exported are delivered to the exact sites they are intended for. Multi-rooftop groups: let us combine your locations in one feed to any shared online classified account. Auction123’s automated data distribution for Commercial Truck dealers provides a seamless integration with any online marketplace or classified site that is willing to accept a feed. Be confident your inventory is accurately advertised without the task of manually maintaining your accounts. Changes to your commercial truck and trailer inventory made from within your Auction123 account will automatically be published to all your marketplaces with the next feed. Advertise your inventory on the top online classifieds and marketplaces like CommercialTruckTrader.com, OPENLANE, and OVE.com where millions of shoppers are looking for their next commercial vehicle. Your data will be fed daily (sometimes multiple times per day) to an unlimited number of sites keeping your inventory up–to-date with pricing, mileage, descriptions, and sold vehicles. If you don’t see an online classified site in our distribution library of over 400 supported feeds, let us know and we’ll set it up. You may have accounts with other service providers your dealership or group works with who need an updated feed of your inventory. With Auction123, we will take care of all your inventory distribution to any service provider necessary. Your feeds to website providers like Dealer.com, will be delivered seamlessly from your Auction123 dashboard. 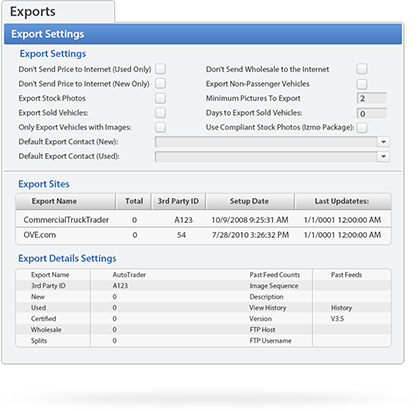 Your Auction123 dashboard will offer complete transparency to all your inventory exports by detailing each website, the number of commercial vehicles fed, and the last export time for all of your selected marketplaces. 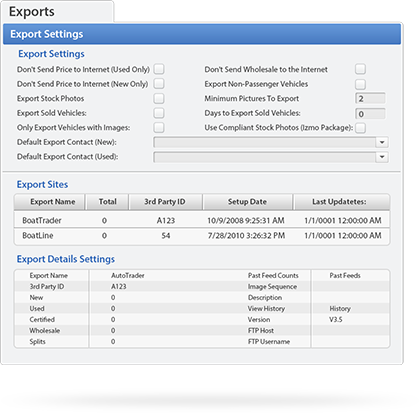 Additionally, we can filter your inventory by nearly any possible parameter to ensure only the vehicles you want to be exported are delivered to the exact sites they are intended for. Multi-rooftop groups: let us combine your locations in one feed to any shared online classified account.